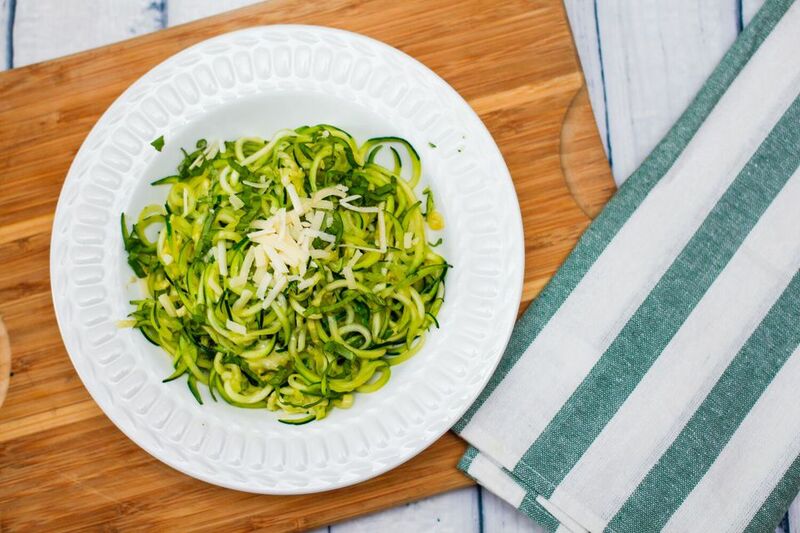 Spiralized summer squash is an excellent choice for a low-carb pasta replacement. It's a light and easy alternative, and it cooks much more quickly than spaghetti squash or pasta. Go ahead and substitute with zucchini if that's what you have on hand. This delicious "pasta" is easily made with a spiralizer or julienne peeler. The spiralized summer squash takes just a few minutes to cook. The dish is yummy served plain with butter and seasonings, or topped with your favorite spaghetti sauce and melted mozzarella cheese. Using a spiralizer, shred the squash into long strands. Alternatively, draw a julienne peeler down over the squash, making spaghetti-like strands. You may use a peeler to make thin, broader noodle-like slices as well. Heat the olive oil in a large skillet over medium heat. Add the squash strands and garlic. Cook, stirring for a few minutes or until just slightly softened. Add the basil and continue cooking for about 30 seconds to 1 minute. Add salt and pepper to taste. Toss the squash with the Parmesan cheese and serve immediately with extra Parmesan cheese on the side for sprinkling. Bacon Cream Sauce: Cook a few strips of bacon until crisp; drain. Sauté a minced shallot or 1/4 cup of onion with 2 cloves of minced garlic into a few teaspoons of the bacon grease. Add 1 cup of heavy cream and cook for 4 to 5 minutes, or until reduced and thickened. Add about 4 tablespoons of Parmesan cheese. Crumble the bacon and add it to the sauce. Simmer for about 1 minute, or until the cheese has melted. Toss with zucchini or yellow squash noodles. With Shrimp: Cook 2 cloves of minced garlic in a skillet with 4 tablespoons of butter until softened. Add 2 pounds of cleaned and deveined shrimp to the skillet and cook until they are opaque. Remove the shrimp with a slotted spoon and add 1 cup of heavy cream and a tablespoon or two of sherry wine to the skillet. Bring to a simmer and simmer for about 4 to 5 minutes to reduce. Add the shrimp back to the sauce and serve over zucchini or summer squash pasta.